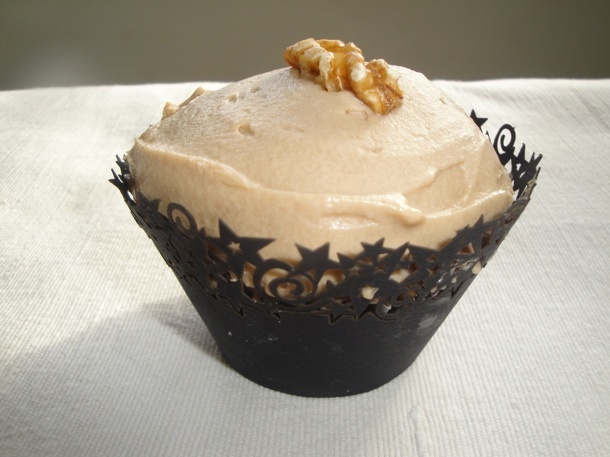 Here is a simple Coffee and Walnut cupcake sponge recipe. Add the eggs one at a time, beating in-between each egg. Sieve the flour and baking powder together then fold into your cake batter. Place in middle shelf of oven at 160c check after 20 mins, test with a knife in the centre, if it comes out clean the cup cakes are ready, if there is batter on it bake for a further 8 mins. The cakes should be a light golden brown in colour and firm but spring to touch, if you have a fan assisted, bake it at 155c. Cream your butter and icing sugar and cornflour together with the vanilla flavour, coffee mix and milk.